Update and correction from the H2KNOW campaign: the data for this blog post were from the USGS website, and have subsequently been revised upward to flows around 700cfs. “Provisional Data Subject to Revision” is noted on the river gage website. Current flows of around 700 are extremely low, while not yet at historic lows. Despite low flows, water use remains high. 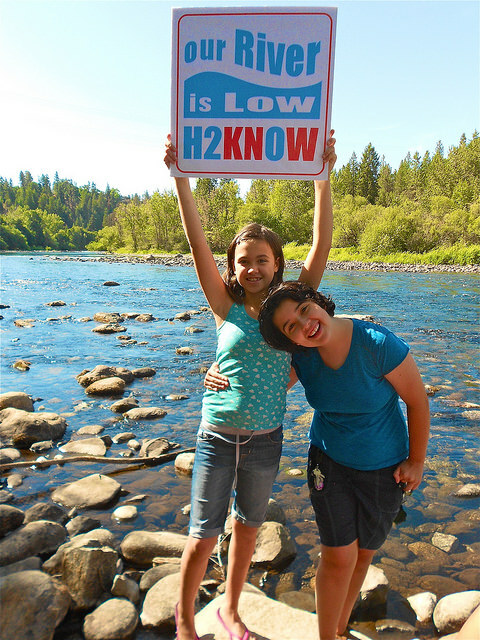 Today the H2KNOW community water-conservation campaign sounded the alarm that water levels in the Spokane River dropped below 500 cubic feet per second (cfs) for the first time this summer. Meanwhile, City of Spokane water use is at an all-time high: 3.8 billion gallons in July, or 122 million gallons of water each day. Water supply is provided by groundwater from the Spokane-Rathdrum Aquifer. The Aquifer also supplies water to the Spokane River. Increased groundwater pumping for human use directly depletes flow in the River. Hot temperatures approaching 100 degrees are forecast again for much of this week. Drought combined with excessive water use by the 500,000 people living in this basin are causing historic extremes in low flow for the Spokane River. The lowest flows ever recorded are in the mid-400 cfs range, and we have begun to break the record according to the USGS Spokane River gage. Low flows harm fish, wildlife, recreational opportunities, and businesses that depend on the river. Comparing flows now with prior years underscores the terrible condition of the river and the need for people to act. One year ago, in 2014, lowest flows were about 900cfs. When Spokane was a young city in the 1890s, flows ranged from 1500-2000cfs in August. River flows are monitored at a stream gage near the Monroe Street dam, the oldest continuous gage in Washington State. On November 7, CELP and other river advocates filed nearly 2,000 comments and released Spokane River studies criticizing the Dept. 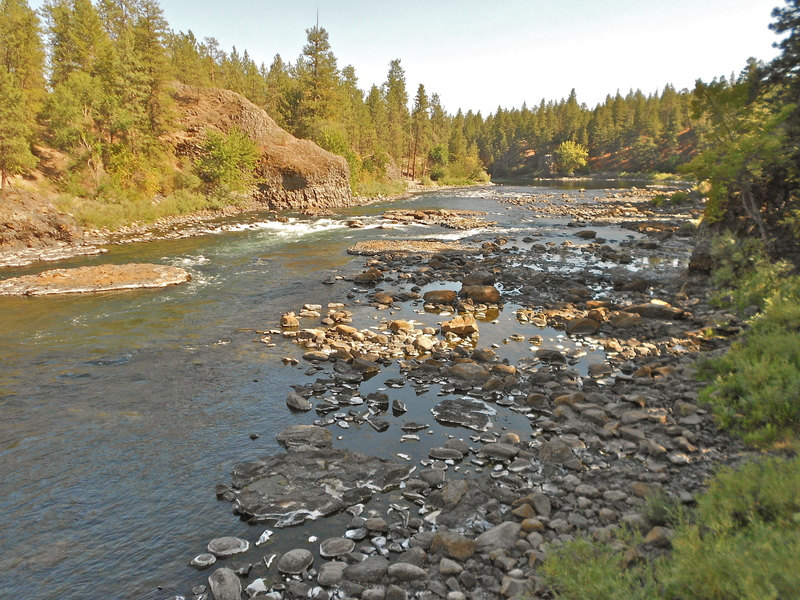 of Ecology’s proposed rule for the Spokane River. The Ecology proposal would set instream flows, including summertime low flows at 850 cubic feet per second (cfs). Spokane River flows exceed this number for most of the summer every year, but all water above 850 cfs will eventually be taken by Washington and Idaho for out-of-stream water rights under this proposal. In proposing such extreme low flows, the Department of Ecology ignored statutory requirements to protect recreational and navigational values of the Spokane River. Preliminary findings from an American Whitewater survey, asking Spokane River boaters about their flow preferences, show that all boaters prefer flows higher than 1000 cfs and most prefer flows in the range of 5000 cfs. Flows less than 1000 cfs are considered unfavorable to boaters and can cause damage to some craft. Numerous boating groups, individual paddlers and whitewater-based businesses commented on the inadequacy of the proposed flows to protect recreational use of the river. Ecology also failed to assess scenic values of the Spokane River as it flows through the gorge, prompting river advocates to undertake their own photographic study. CELP’s atlas of 37 key observation points of the Spokane River’s downriver reach, inventorying the reach between the Monroe Street bridge in downtown Spokane and Nine Mile reservoir, documents five different flows ranging from 2,800 to 1,000 cfs. CELP also submitted a memo from Confluence Research & Consulting, a firm that provides training to Ecology staff, describing methods to conduct aesthetic flow studies. Ecology also failed to consider the interstate water supply ramifications of its proposed rule. Since 2002, Idaho has issued 901 new water rights from the Rathdrum Aquifer, which feeds the Spokane River in Washington. CELP synthesized the Idaho database and provided an “Idaho Water Rights Report” with its comments. Multiple businesses, organizations, and individuals who would be harmed by the proposed low flows submitted comments, altogether about 2,000 comments. In addition to recreation, aesthetic and interstate issues, commenters questioned the impact of extreme low flows on redband fisheries and water quality, and noted that Ecology failed to consider needs related to restoration of anadromous fish to the Spokane River. The draft rule also failed to consider the economic impact of its proposal on small businesses that rely on a healthy Spokane River, and did not consider climate change impacts, despite an executive order that requires climate change analysis as part of all state agency decisions. CELP has been involved with Spokane River flow advocacy since 1999, serving on the WRIA 55/57 watershed planning unit and its instream flow subcommittee through 2012. Watershed planning failed to achieve consensus and, per statute, the flow setting decision then transferred to the Departments of Ecology and Fish & Wildlife. Ecology has erroneously suggested in public settings that the extreme low flows proposed in the rule were a product of the watershed planning process. In private conversations, agency staff admit the proposal is a “split the baby decision” intended to pacify Spokane basin water users. In 2008, CELP challenged the instream flows established for the Spokane Falls in Avista Corp.’s hydropower license, based on failure to protect aesthetic flows. That appeal resulted in a settlement restoring water to the Upper and Lower Spokane Falls 24/7/365. Ecology may adopt the draft Spokane River rule as proposed, or could return the flow proposal to draft status and re-evaluate the need for higher flows to preserve public values. “This is the worst PCB contamination problem of any river in the state.” With these opening words, on Monday July 21 expert Clean Water Act attorney, Richard Smith of Smith & Lowney, argued to federal Judge Barbara J. Rothstein that the U.S. Environmental Protection Agency (EPA) failed in its duty to adopt a PCB cleanup plan for the beautiful but troubled Spokane River. In 2011, CELP joined with Sierra Club to sue the EPA for failure to prepare a PCB clean-up plan (known as a “total maximum daily load” or TMDL) for the Spokane River. 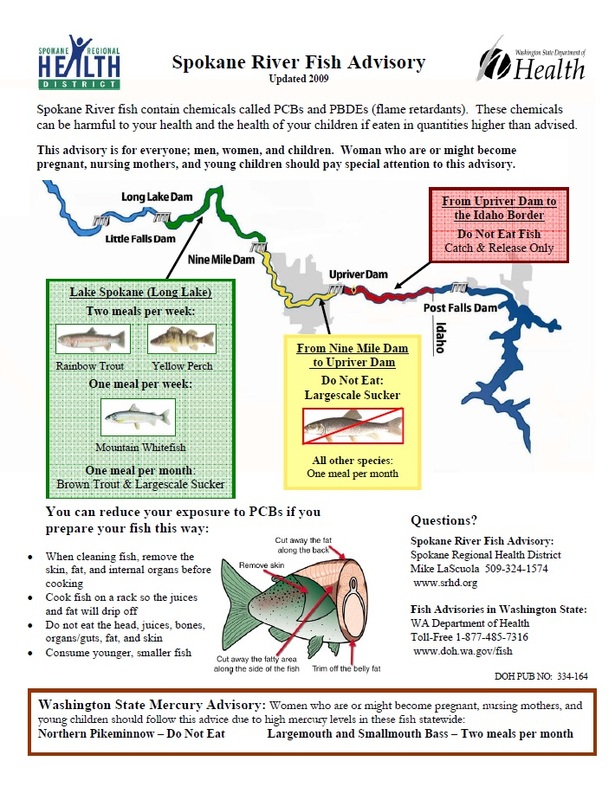 At issue is PCB pollution so severe that public health advisories warn against eating fish from the river. PCBs are a group of industrial compounds associated with liver dysfunction and cancer. Wildlife are also vulnerable to PCBs. Manufacture of these compounds is now banned in the United States, although they continue to persist in the environment due to past use. The Spokane Tribe, whose reservation is downriver of the dischargers, intervened as co-plaintiff, in part because of the EPA’s failure to protect tribal water quality standards for PCBs and other toxic chemicals. The Tribe’s standards are the first fish consumption-based standards adopted in Washington. EPA’s disregard for these human health-based standards provides a cautionary look into how federal and state agencies will implement the newly announced fish consumption standards for the rest of the state. On Monday, July 21, the matter of Sierra Club and CELP v. Dennis McLerran was heard by Judge Rothstein at the federal courthouse in Seattle. 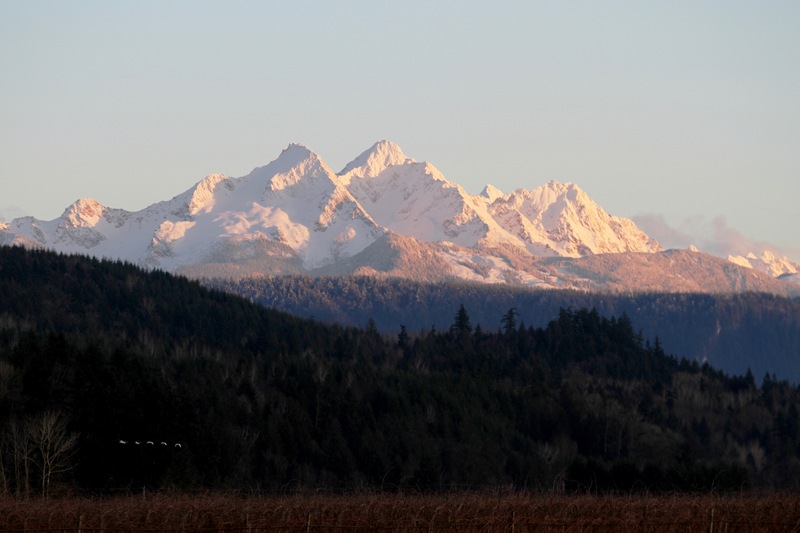 In her questions to attorneys for EPA and the Washington Department of Ecology, Judge Rothstein articulated her understanding of what is at stake in this case. Ecology has created a local “task force,” made up of Spokane River polluters, who now control what to do about PCB pollution. Ecology established the task force to substitute for both a cleanup plan and placing limits on PCB discharges from the five treatment plants on the river. Judge Rothstein questioned whether the task force approach can achieve actual cleanup, given that there are no milestones, deadlines, or criteria for progress, and the consensus approach gives the polluters a veto over any action of the group. The Judge also noted the absence of PCB limits in pollution permits, which normally operate to control toxic discharges from treatment plant pipes. Additionally, Judge Rothstein expressed interest in the threats posed to members of the Spokane Tribe, who consume fish from the Spokane River. PCB concentrations increase as the river flows downstream, putting Spokane Reservation residents at particular risk. Following argument, Judge Rothstein invited lawyers for all parties to her chambers and suggested the parties attempt to settle the case before she rules. Stay tuned for what happens next.